The taxi driver and I make small talk—amicable and slow, the nature of almost every conversation I have in Indonesia—as he navigates the dense knot of traffic. It is rush hour in Semarang, and we’ve got nothing but time. Once we move past the requisite pleasantries (Dari mana, Miss? Tinggal disini berapa lama?) (I am from America! I will stay here 9 months! ), I tell him that I am working here as an English teacher. He then asks a follow-up; this one is new for me. “Kapan anda pulang ke Amerika, akan anda bekerja? Sebegai apa?” When you return to America, will you work? As what? Momentarily flustered by the very question for which I have no answer, I pause for a moment, then respond by co-opting the phrase “Inshallah,” which I hear frequently in this city. Inshallah is an Arabic word meaning “God willing.” There is something uniquely beautiful in this phrase; it is an acknowledgement of the unknown and an appeal to the promise of the future. I have also surmised that it is the polite way to decline an invitation that underwhelms (i.e. me on the first day of class: “Does anyone want to start a girl’s football team?” “Inshallah, Miss”). If I had a nickel for every time I heard the expression, I’d be halfway to Bali by the time you finish this sentence. The taxi driver whips his head around, animated with interest. “Miss, you Muslim?” He probes, in English this time. After I shake my head no, he furrows his brow in confusion. “But, you say, Allah…” and trails off in uncomfortable silence. I realize my mistake. Inshallah is not an “Indonesian” word. It is an Arabic phrase used by Muslims. I am not Muslim. I have used an expression that Muslims use despite the fact that I am not one. “Inshallah” is nearly ubiquitous in Semarang because I live in a predominantly Muslim city. I teach at a Madrasah- the strictest type of Islamic educational institution found in Indonesia. The environment I have adapted to is a distinctly Islamic one. Seemingly inconsequential exchanges like this serve as reminder that I no longer reside in a secular world. Living in a non-secular world means that there is no boundary between religion and culture. Religion is an inextricable part of Indonesia. In my city, like most of Indonesia, that religion is Islam. I spent the first month of my grant period trying to compartmentalize “Javanese customs” and “Islamic customs.” I wanted to organize these customs into two distinct practices, which quickly proved futile. I became cognizant of the numerous ways in which Islam has permeated Javanese culture—in its speech, food, entertainment—and vice versa. The imprint of Islam on Javanese culture is vast. I found myself at an intersection of tradition and faith. I am currently still finding myself there. Navigating these blurred non-secular waters is tricky at times simply because it is all so new to me. I was a student of the secular American school system. Prior to living in Indonesia, I had no experience with religious education whatsoever. But here, I teach in a Madrasah. I wear a jilbab (the Indonesian hijab) to school. Every morning I greet students and teachers one by one; after we grasp hands, I place my hand over my heart as is dictated by Islamic custom. I observe my students’ Arabic classes, and I am learning about the Qur’an. 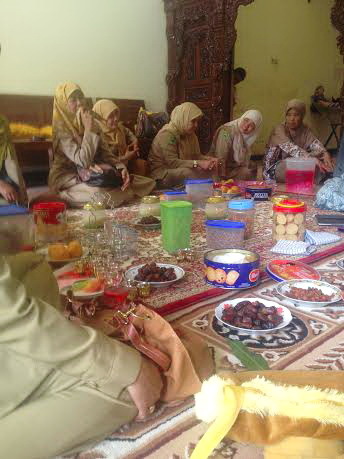 My social life is comprised of Islamic celebrations (of which there are just a few per calendar year), Javanese/Islamic weddings, and outings with the teachers from my school that often conclude with prayer. On one such outing last week, I was told we were just “going to lunch,” shoved into a maximum-capacity van filled with paks and ibus, only to find two hours later that lunch was unfortunately not even part of this equation—I was actually being brought to the house of a teacher who had just returned from Mecca. Cross-legged on the floor of Pak Suyartna’s house, I bumped knees with an Arabic teacher and the vice principal of my school. We listened as he regaled us with the story of his journey to Mecca (sadly, I was able to understand perhaps one in every twelve words). He led us in prayer, and I was prompted to join in. “Like this, Eliz,” the Arabic teacher whispered conspiratorially as he positioned my hands so they hovered above my legs, palms upturned to the ceiling. Afterwards, the hosts provided small glasses of Zamzam – holy water brought back from Mecca—and offered me two, three, four cups of this sacred drink. I was gifted with an intricately embroidered prayer mat. I left Pak Suyartna’s house later that afternoon and dually humbled and confused by their hospitality. As a non-Muslim, drinking the Zamzam does not hold the same significance for me; I could not believe they had offered me multiple glasses of the water Muslims venerate. The prayer mat is beautiful but I cannot see or picture how I will use it. The nebulous area where Indonesian culture and religion meet is where I often feel like a secular fish out of water. Where Indonesian culture and religion meet is where I often feel like a secular fish out of water. But here’s what I have since come to deeply appreciate: I am privileged. I am extraordinarily lucky to be included in intimate religious rites that most non-Muslims will never be exposed to. My status as a religious minority in this city is not restrictive. Rather, it affords me limitless opportunities to learn how to adapt to a culture that is largely defined by religion. My students are my teachers, and I their diligent pupil of Islam. I am learning how powerful an influence Islam is in the lives of the Indonesian people I love. I am learning to appreciate its nuances. I am gaining insight into its mysteries. I am finding beauty and meaning in religion like never before. Slowly but surely, I am learning stay afloat in non-secular waters. About the author: Elizabeth (Eliza) Silverman graduated from Scripps College with a degree in politics & international relations. Placed in Semarang, Central Java, she enjoys white rice, high-fiving students, and killing mosquitos. Mecca is the capital of Makkah Province in Saudi Arabia. It is the birthplace of the prophet Muhammad and regarded as the holiest city in the Islamic religion. Hajj, the annual pilgrimage to Mecca, is a mandatory religious duty for adult Muslims if they are physically and financially able. It is considered the ultimate submission to God (Allah). November 11, 2014 in Culture. Beautifully written and very evocative. I spent the better part of last year living with Muslim Indonesians all over Indonesia and you have beautifully summed up my experience. I too felt enormously privileged and consequently consider that Indonesia’s practise of Islam to be very open and gracious. My questions were consistently answered respectfully no matter how ignorant and my curiosity to experience aspects of Islam eg., a days fast during Ramadan were regarded as a compliment and delightedly shared with all and sundry. Thank you once again for writing so sensitively about Islam in Indonesia.